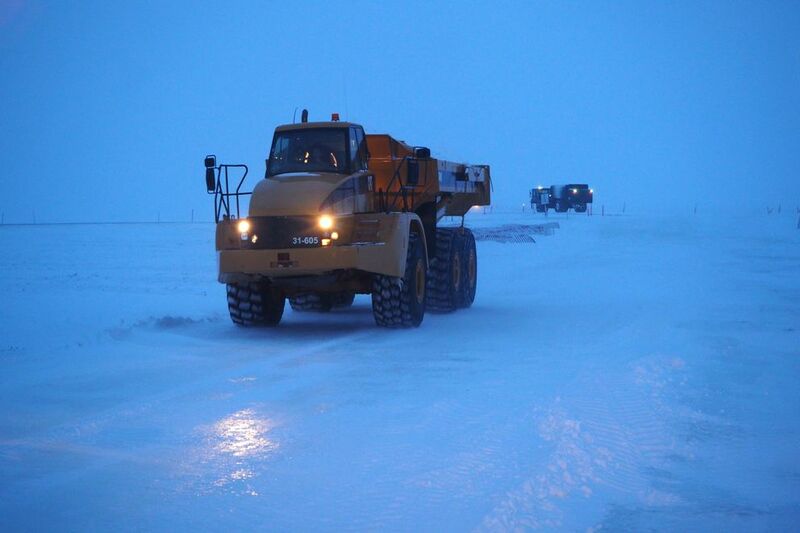 Specialized vehicles with rubber, tank-like tracks will build more than 600 miles of ice and snow roads across the North Slope this winter, punching open paths to usher drilling rigs to exploration sites and village residents to cities. 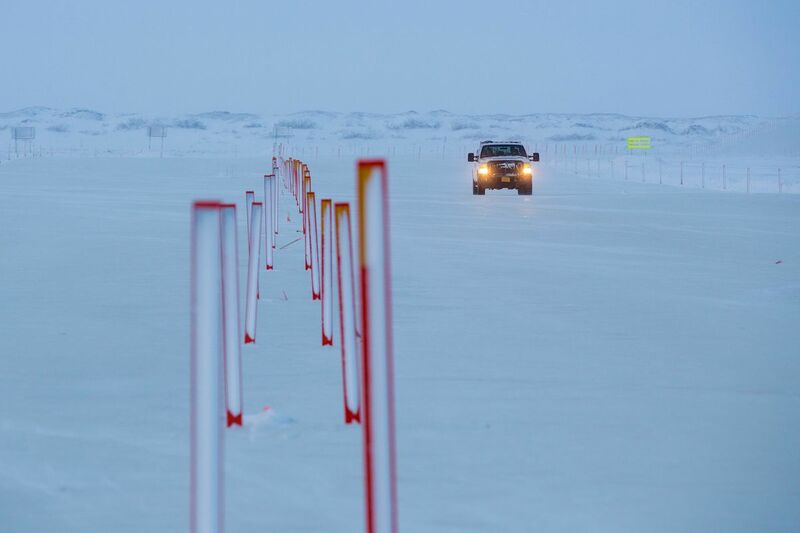 The construction of the temporary roads, frozen thoroughfares that melt in May, is having the busiest season in the oil patch since petroleum prices crashed in 2014, said Melissa Head, who runs the state’s ice-road permitting office. “In terms of the number of projects, this is the busiest year we’ve had since the downturn,” Head said. The work, already underway in some areas, signals the improving fortunes of a vital Alaska industry. State officials told lawmakers in January that North Slope drilling activity is the strongest in two decades, as oil companies target new opportunities following recent discoveries. 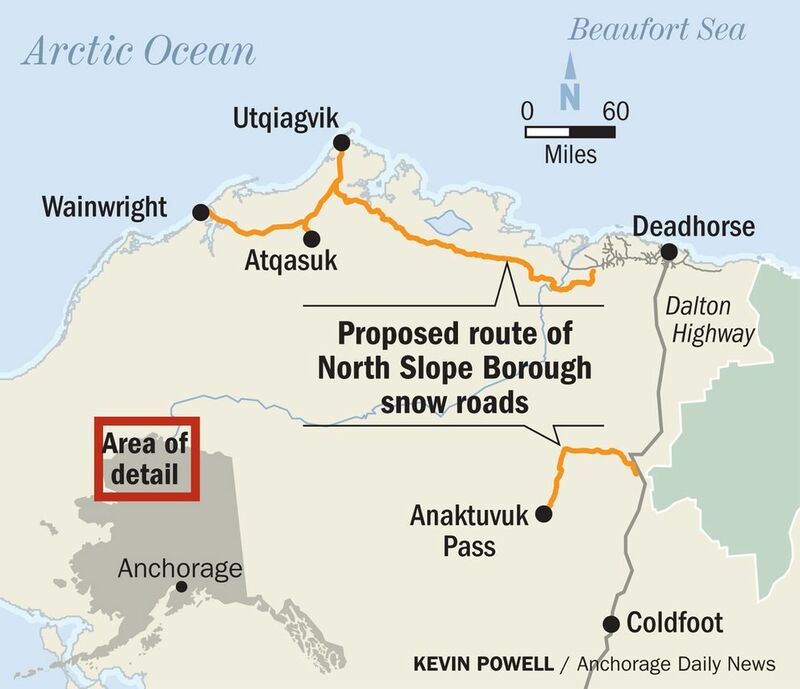 In a separate effort, the North Slope Borough plans to connect four remote communities by snow road to the state’s highway system, expanding last year’s program, officials said. 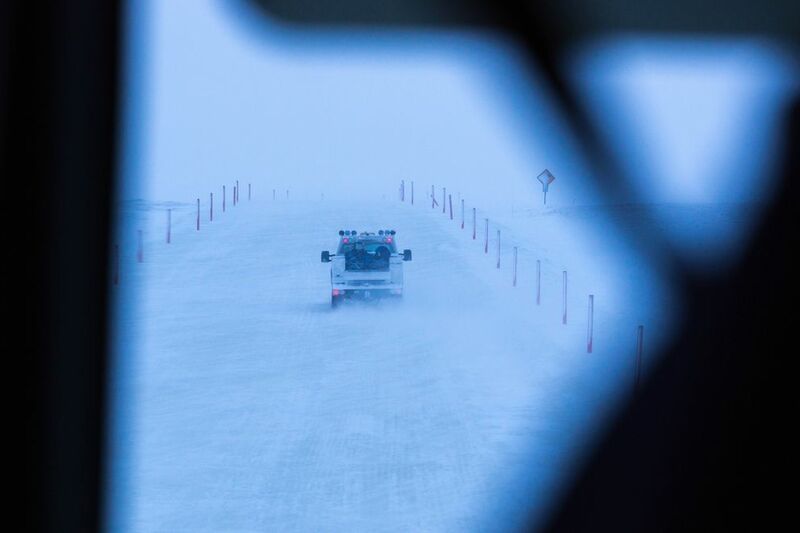 Once the snow is packed down enough, pilot vehicles will guide trucks and cars through a wintry moonscape subject to blinding whiteouts and 40-below temperatures. The borough-maintained roads will give residents an alternative to costly flights, and access to cheap big-city stores. “It is a life-link for us out here,” said Doug Whiteman, a city councilman in Atqasuk, population 250. Yet they’re tons of work. Once snow cover and frozen ground meet state requirements to protect the tundra, scouting crews in tracked rigs test the ice at stream crossings and elsewhere. Larger, tracked vehicles, like those you see on ski slopes, pack the snow along the route. The depressions fill with windblown snow, and the rigs make repeated passes to solidify the route. Many of the frozen roads are being built on the western edge of the oil patch, home to the new discoveries that ConocoPhillips and Oil Search, of Papua New Guinea, want to develop. Evidence of the roads -- the packed routes take longer to melt than surrounding tundra -- dissipates within one to two years when constructed properly, as they usually are, Head said. “We don’t think it has long-term impacts," she said. A plow blade occasionally slices through tundra, but that’s rare nowadays, she said. * Oil Search, ConocoPhillips and Great Bear drilling exploration wells, requiring about 175 miles of snow and ice roads. *Four seismic shoots, including one near the Arctic National Wildlife Refuge, requiring a 45-mile snow road. The surveys provide detailed readouts of drilling opportunities. *Olgoonik Construction Services, a Native corporation, plugging and cleaning up old federal wells drilled near the National Petroleum Reserve-Alaska in the early 1950s, adding a 120-mile snow road. Head’s list doesn’t include a seismic shoot in ANWR, a project delayed and thrown into doubt this winter by the five-week partial government shutdown that began Dec. 22. The borough, meanwhile, plans to open and maintain snow roads connecting Utqiagvik, population 4,500, with tiny Atqasuk and the highway system. The system would stretch 300 miles. The borough also hopes to add snow roads connecting Wainwright and Anaktuvuk Pass, according to correspondence with regulators, adding 150-plus miles if built. The borough’s guided convoys help ensure safe travel in harsh conditions, said Wixon, with BLM. And they help protect the tundra by keeping trucks, snowmachines and four-wheelers to one path. Lois Epstein, Arctic program director for The Wilderness Society, said conservation groups are concerned about ice roads, built with water pumped from lakes, impacting fish. But they have generally not expressed concerns about snow roads, especially those helping village residents. “If they work and don’t show damages to the tundra, then that’s a good thing,” she said. Della Segevan took advantage of the borough-maintained snow road last year. She paid a small shipping company in Utqiagvik $5,000 to pick up a new Toyota Tundra in Anchorage and drive it to her home in Atqasuk. She said she saved thousands of dollars on air cargo. The five-day trip put hundreds of miles on her truck, but it arrived in excellent condition. “I was amazed,” she said. “Nothing bent or broken." Next, Segeven and her family drove the new truck to Utqiagvik during the guided caravan. They loaded it with groceries unavailable at the small store in Atqasuk. “It meant a lot to me,” she said of the snow road.